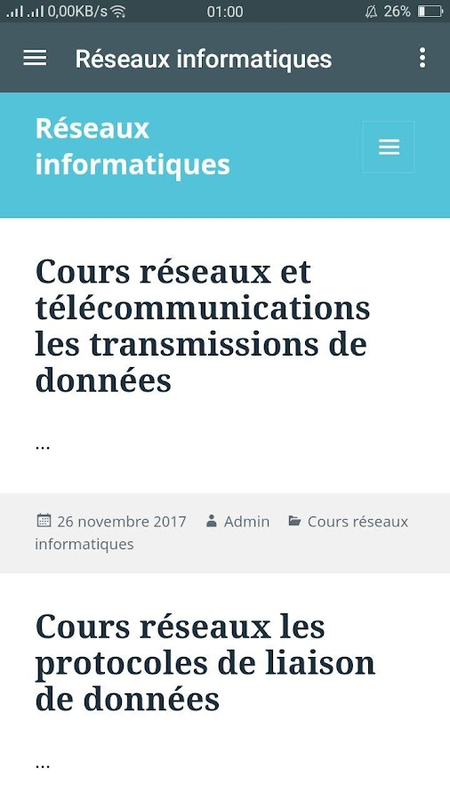 Cours informatique de base, bureautique, traitement de textes,tableur, retouche d'images, programmation..basic computer courses,Office, word processing, spreadsheet, image editing, programming ..
Cours et formation facile et avancé sur la maintenanceinformatique, Cours maintenance ordinateur entretenir et optimiserson pc.. Courses and easy and advanced training in computermaintenance, computer service Course maintain and optimize pc .. Basic informatics course for beginners, studying computer andinformation technology using information and communicationtechnologies, ranging from the basic learning of the use of thecomputer, to the handling and application of specialized software,according to the latest technological trends, including internet,for the Increased productivity in different economic activities.Use the "Select Language" button to change the language. Free computer course, learn basics to use the computer as well asthe basic knowledge to surf the Internet, use email, use socialnetworks, etc. The course aims to be a computer manual to help yougain computer skills and as a first step to become an advancedcomputer user, which will serve to your daily life, your studiesand work. Use the "Select Language" button to change the language. The computer course is designed to aim at imparting a basic levelappreciation programme for the common man. After completing thecoursethe incumbent is able to the use the computer for basicpurposes of preparing his personnel/business letters, viewinginformation on Internet (the web), sending mails, using internetbanking services etc. This allows a common man or housewife to bealso a part of computer users list by making them digitallyliterate. This would also aid the PC penetration program.This helpsthe small business communities, housewives to maintain their smallaccount using the computers and enjoy in the world of InformationTechnology. This application is 100% offline & Completely Freeto download, so no need of internet can download the app once andcan access all the material without internet connection .We havebuild this application in HINDI and English in very simple language.User can easily share topics for friends, relative viaSMS,watsapp, facebook,email etc .This application easy to start ,This app will also help you to bookmark your favorite shayari forfuture references, set reminder and move to particular date .Computer Course Application following important topics: *Fundamentals of Basic Computer Operations * Microsoft Word *Computer software * Computer short keys * Computer G.k. * Interviewquestoins answare * Internet * C language * Java * .Net * PHP/ HTML/CSS * Tricks and Tips for daily computer use * * Thanks in Advancefor Downloading... Download it and enjoy. ForAnyList is a versatile list manager that allows you to createand maintain all kinds of lists, like to-do lists, check lists orshopping lists. It lets you manage your lists in an intuitive way.For example, you can easily reorder the tasks of a to-do list in alogical sequence (e.g. most urgent at the top), change the textcolor of a task to indicate status, or create sub-tasks (insub-lists or folders) to structure your task list. Optionally youcan mark a task as urgent or link a task to one or more personsand/or locations. You can then view your collection of tasks orother notes in four different ways: 1. All notes: A list of allyour notes (tasks, products, wishes, etc. ), typically divided intosub-lists; 2. Today: A list of tasks or other notes that need shortterm attention; 3. People: A list of tasks associated with, orassigned to, specific persons, so a to-do list per person; 4.Places: A list of tasks associated with specific locations, so ato-do list per location. Another nice feature is the archive. Useit to show tasks or notes that have been completed/deleted in thelast 3 months. For example, the tasks you completed today oryesterday, or all completed tasks for "Project X" in the pastmonth. Furthermore, you can restore (accidentally) deleted notesfrom the archive, or supplement a shopping list with archivedproducts (you bought before), so without the need to re-enter theseproducts. Other features are: • Automatic detection of websites,email addresses and phone numbers. • Add pictures or otherattachments. • Add values or calculations (quantity x price) toyour notes and show totals per list (also works in combination withshopping lists). • Search your collection of notes by keyword andbrowse through the search result. • Choose the date on which a taskshould appear in the list Today. • Receive a reminder at the chosenday and selected time. • Define recurring tasks that show up, say,every Wednesday or every 1st of the month. • View all scheduledtasks and change them if you want. • Copy a task to your calendar,including repeat information. • Create sub-lists inside a list. Thenumber of levels is unlimited (multi-level). • Easily move a note(or a list) from one list to another. • Drag a note into a sub-list(with undo). • Swipe a note to the right to delete (with undo). •Delete multiple notes easily (useful for erasing a shopping list).• Sort a list by alphabet or by other attributes (such as textcolor). • Define your own color sequence for sorting. • Sort a listautomatically after adding a new note. • Copy a list (includingsub-lists). • Use the widget to show the list “Today” on your homescreen. • Create shortcuts on your home screen to your lists andsub-lists. • Print your to-do list or shopping list with a browser.• Exchange lists with other ForAnyList users. • Import notes fromordinary text files. • Make a backup of all your notes andpreferences and restore when needed. • Email your backup file, forexample to your new smartphone. • Lock your shopping list when youare in the grocery store. • Change the appearance of ForAnyList.Choose from seven predefined themes. • Help is available (but youprobably won't need it). • Use ForAnyList in portrait or landscapemode. • Move the app to the SD card (if you don't need the widget).• No internet permission to protect your privacy. The onlypermission ForAnyList needs, is the right to access externalstorage, for example for storing photos and reading backup files.There is also a free trial version available in the Google PlayStore. Search for “ForAnyList To-Do List". The free version ofForAnyList offers exactly the same functionality as this regularversion, except that the maximum number of folders (read:sub-lists) is limited to 10. To-do list, check list, wish list orshopping list. It makes no difference. This list manager is FOR ANYLIST.